The Nekromantix are Denmark's finest Psychobilly band. A great mix of psychobilly, goth, and speed-metal, all in their unique Nekromantix style. This CD (their second) is said by many to be their best. 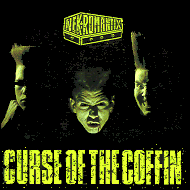 It has that unique Nekromantix sound - a blend of speed-metal, goth and psychobilly. Their best songs seem to have the backing tempo going at twice the speed of the lyrics - it's hard to explain, and is best heard, so click on any of the songtitles and download the Nekromantix sound. All this is produced 'live' to awesome effect! It was produced by Mickey Mutant in England under great stress (we still have his medication bill!). Kim Nekroman blew out his speaker in his bass amp on the first day of recording and Roland von Matzau (their one-time manager) was, well ... Roland von Matzau (eyes like lasers, grip of steel). The world awaits the return of the Viking hordes with trepidation! As someone once said, "There's something rockin' in the state of Denmark".